The Fast models are versatile-sounding, they’ll work well both on stage or for recording, and they’ll sit seamlessly within a set-up amongst their more expensive brothers. Great quality at a refreshingly low price. You can draw comparisons between cymbals and wine. The trends, the objectivity of 'what’s best', the flowery adjectives used to describe the ‘tonal palette’. But just like wine, where options at the lower end of the price spectrum used to be limited to red, white, or rosé, affordable cymbals are no longer just ‘crash’, ‘bigger crash’ or ‘ride cymbal you’ll shift as soon as you can’. That’s down to companies such as Sabian haulin’ brass and delivering us cash-strapped drummers cast cymbals made from the same B20 alloy as their expensive top-end ranges. 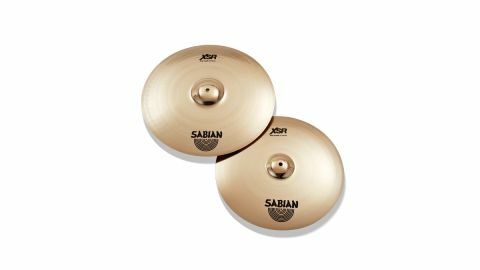 That’s exactly what Sabian’s XSR (launched last year and taking over from XS20) series does, and these latest additions refine the offering with a pair of 17" and 19" Fast crashes. Our first observation on getting these out of the box is that Sabian’s claims of advancements trickling-down to lower levels are true. They look very similar to our own AAX models in feel, colour and finish, with only a slight difference in the wider lathing pattern of the XSRs. These Fast models are described by Sabian as ‘thin’ and sit as the thinnest in the XSR range, which also includes the thicker, brighter and louder XSR Rock and the darker, more complex XSR Monarch cymbals. ‘Fast’ when applied to crashes generally means that you hit them, they open up and then decay quickly, getting out of the way without fuss. That’s what these do, but that shouldn’t be confused with the sharp attack of accent cymbals. These are still cutting - they aren’t quiet cymbals - while retaining a smoothness and sounding how you want a crash to sound. Thanks to the thinner profile and the XSR’s bell size (smaller than the XS20), these cymbals open up with a medium strike, so you don’t need to leather them (although we certainly weren’t shy of playing them heavily in a band situation either). In fact, with these Fast models, beyond a certain point it feels like hitting harder isn’t going to achieve more volume - they are quite explosive, with a quick decay, so they won’t be the best choice for big, washy crash/ride patterns. Whenever price tags are cut, it’s natural to look at which corners have been too. Here, it’s extremely difficult to see. Of course, XSR is not Sabian’s entry-level range, but make no mistake: what you’re getting here are pro-level sounds at mid-level prices.